Computational fluid dynamics (CFD) is a valuable tool used by gas turbine designers to simulate the flow, spray, combustion and heat transfer found within the combustor. Designing the combustor at the heart of a gas turbine is a complicated balancing act between many competing design constraints including the demand for optimized power and efficiency with minimal fuel consumption, weight and emissions. CFD has been playing an increasingly important role in assisting combustor design in the recent decades due to its increased accuracy and model fidelity, and has been proven invaluable for reducing or minimizing the expensive and time consuming testing. However, there are still major challenges that prevent CFD from being used for all facets of combustor design. The most significant challenge is simulating combustor relight for a wide range of combustor operating conditions corresponding to the relight envelope. It is not uncommon for designers to find a specific design through numerous iterations that meet the targeted pressure drop, flow splits, temperature profile and emission but only to find out that it misses the relight requirement during the testing and has to start over. Therefore, the ability to simulate and predict relight is extremely valuable for gas turbine designers. Kinetically Limited Chemistry: The ignition and subsequent light around during relight is inherently a transient process dominated by complicated chemical kinetics and its complex interaction with turbulence and spray. To capture the critical combustion features during a relight correctly, such as initial flame kernel formation, flame propagation, quenching and stabilization, a detailed chemistry needs to be solved directly whenever possible. This is because these features directly depend on fundamental flame properties such as ignition delay, flame speed and extinguishing strain rate, which can only be captured accurately when radical species such as H and OH are computed directly. Unfortunately, the minimum mechanism size required to capture these contains typically at least 30 species even for a reduced mechanism. Solving transport equations for this many species directly has been formidably expensive for traditional CFD codes. Meshing Difficulty: Traditional CFD tools require a mesh to be generated manually before starting the solution. The more complicated the geometry, the more time consuming the mesh generation process becomes. Modern gas turbine combustors typically exhibit extremely complicated geometry such that it is common for a mesh to reach multi-million cells in size or larger for a single combustor sector using conventional meshing tool, which significantly increases the computation time and mesh generation time. It is common for combustor designer to spend days or even weeks to create a mesh of satisfactory quality. Moreover, relight simulation requires modeling multiple sectors due to important non-periodicity effect, which adds considerably to the meshing time and mesh size. 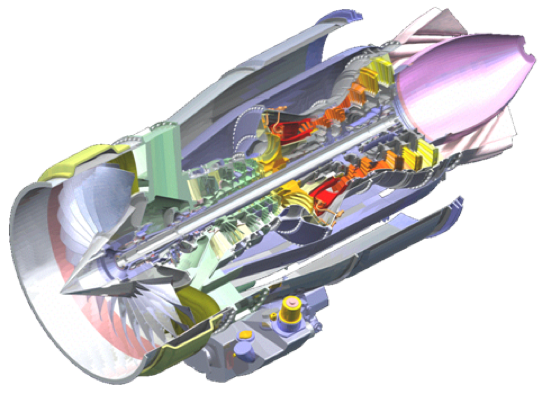 While there are many commercial CFD codes available, Honeywell Aerospace has used CONVERGE CFD software to find a solution for modeling relight. A five sector combustor geometry that consists of an igniter, one pilot fuel nozzle and four airblast fuel nozzles are created for relight simulation. While the process of extracting geometry information from solid CAD geometry to the solver is similar to other tools, once the surface geometry is created CONVERGE CFD eliminated the time consuming meshing task completely. 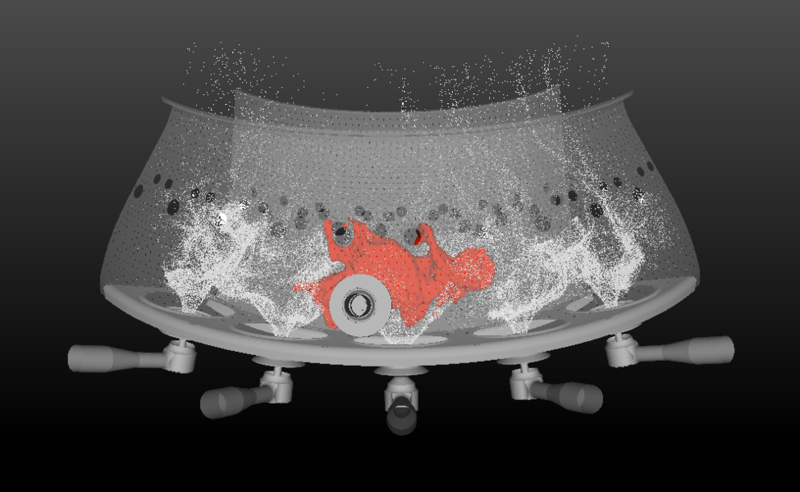 CONVERGE CFD achieves this by employing its characteristic orthogonal mesh that avoids any cell skewness or quality issue, and a technique called auto-mesh refinement or AMR. It generates a starting base mesh by using a uniform cell size that typically results in an overall mesh size much smaller than one million for most combustor geometry. AMR then automatically adds smaller mesh elements when and where they are most needed during the transient simulation, typically surrounding the premixed flame front or a shear layer that exhibits large gradient in temperature, velocity, and species concentration. Each level of refinement reduces the cell size from previous level by half and as such, four levels of AMR will result in a cell size of 0.25mm even if the base grid is as large as 4mm. This feature is essential if one wants to resolve the flame thickness, which can be as small as 0.1mm for aviation fuel. On the other hand, in cold flow region and certain regions of combustion where flow field is relatively uniform and turbulent structures are large it is unnecessary to mesh that region with very fine mesh elements. 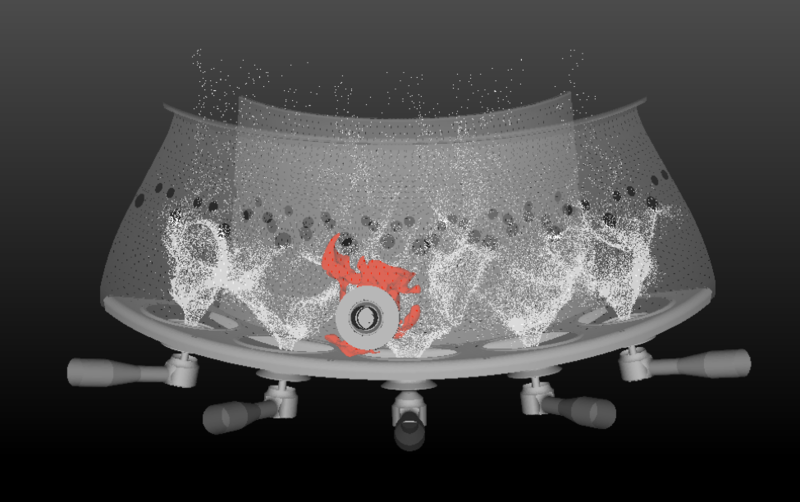 CONVERGE CFD thus optimizes the mesh dynamically throughout the simulation and offers user the advantage of mesh control. For relight simulation, Honeywell used a detailed mechanism containing 52 species that was directly solved using the integrated detailed chemistry solver in CONVERGE CFD called SAGE. Coupled with AMR, SAGE solved the detailed chemical reactions coupled with the transient turbulent flow simulation using a suite of turbulence models including both RANS and LES. 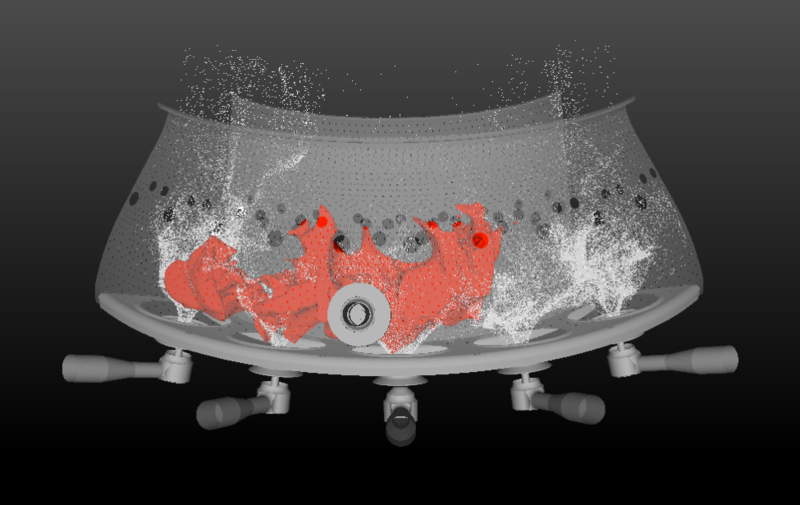 Honeywell relight simulation also used a CONVERGE CFD feature called multi-zone that merges cells with similar properties together to further save the run time. In addition, Discrete Phase Model (DPM) is utilized with sub-models to simulate collision, coalescence and droplet breakup. Parallel processing with dynamic load balancing is utilized to minimize the wall clock time required to complete the simulation. The computation was performed using Honeywell Linux Cluster. It is well recognized that modeling relight accurately remains a significant challenge to the gas turbine community. There are still remaining technological gaps to be filled such as modeling primary breakup, and to model spray and turbulence chemistry interaction in an accurate manner. The latter is particularly important if relight simulation is to be extended to include high altitude conditions. However, with CONVERGE CFD software and its unique features, several key road blocks have been removed and it now becomes possible to simulate relight and help gas turbine designers to assess full facets of combustor performance before testing. NOTE: Honeywell does not endorse products. This article does not constitute an endorsement of any of the products mentioned therein. © 2016 Honeywell International Inc. All Rights Reserved.